of Texas before WWII (World War 2). pilots rain and windproof for windspeeds of 250 MPH (400 Km/Hr). an improvement that they were added to all flare pilots. NAO high performance smokeless flare tip with dual ignition pilots. The operators could NOT BELIEVE this speed, since the old "Brand X"
dual ignition requirement to their flare specifications as a standard. NAO flare pilots are available in standard sizes and lengths of 1 1/4"
at distances of 400'. Click for 1 page PDF NAO flare pilot info sheet. NAO developed & patented self-lowering flare pilots in the 1980's. toxic gases and wet corrosive atmospheres, e.g., wet gases with high H2S content. Need more information on NAO pilots, please fill it our request form. nconel, Hastalloy). NAO also offers PMI (positive material identification) inspection of alloys. for all pilots ( NAO and others ). Click for pilot parts drawings. Click for pilot testing. 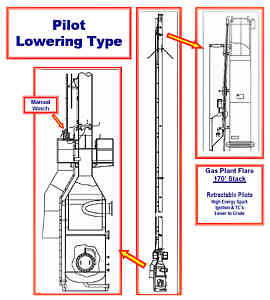 Click for pilot inspection drawing. for your pilot or ignitor. 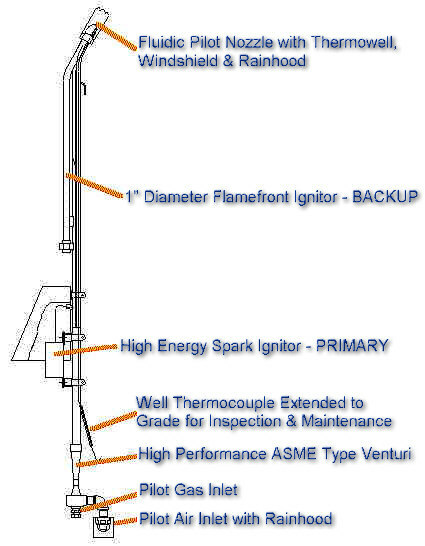 special configurations, gas compositions, inert environments and simulated winds / rains. NAO has remotely installed pilots on an operating flare system, see PILOTS TO GO.